We're refreshing more than just the education industry. Learn what drives us and why we're the best at what we do. Data Nerds, at your service. Gone are the days where data was merely collected and communication was only expected at parent-teacher conferences. In our connected culture, we expect our data to be accessible, timely, and relevant; we also expect our communication to be instant, important, and meaningful. At SchoolStatus, we are passionate that educators have the tools they need to help students. Together, transparent data and purposeful communication are the cornerstone of a child’s educational journey. But without the proper resources to drive change, we’re asking too much of our educators. That’s why we do what we do – to provide indispensable solutions for educators to harness the data, and with it communicate effectively to build strong relationships with all key stakeholders engaged in a child’s success. By using advanced analytics and simple communication tools, we believe educators can improve student outcomes and ultimately change lives. We started out with just a few dedicated individuals from K-12 backgrounds who saw a need for better, more accessible data. Having worked in education, we recognized quickly that teachers simply didn’t have the tools and resources they needed to make data-informed decisions on a day-to-day basis. Out of that need, SchoolStatus emerged. Since those humble beginnings, we have continued to add functionality and service requested by fellow educators to best meet their needs, including powerful reporting, two-way communication tools, and best-in-class customer service. No gimmicks, no hassles, just the tools educators need to do their jobs. We’re SchoolStatus and we’re dedicated to turning data into doing. Create relevant, dependable products that solve real problems. We know our work matters and are proud to be partners in the education system. Take a customer-centric approach to service and carry it throughout our organization and into our products. Champion educators and the work they do for our children and shared future. Make bold moves that challenge the status quo and improve education in meaningful ways. Be present, grab a shovel, do great work, and start making a real difference. We throw an AWESOME crawfish boil! A quarter of our company does NOT go by our given first name. We can build our own tradeshow booth and know how to use a power drill. We employ the world’s leading sweet tea drinker. We know how to have a good time. SchoolStatus karaoke is serious business. Our headquarters has a never-ending supply of beverages... caffeinated or 'other'. Highly. Our framework is housed in an SOC 1/ISAE 3402 facility, using banking-grade encryption technology. We have designed SchoolStatus with strict FERPA compliance as the baseline rule. The Family Educational Rights and Privacy Act- read more about it on the official website here. This act works to protect public school student data from nefarious organizations. Are you aware of the revisions to FERPA? Are you prepared? Yes, we have been tracking the federal regulations and our legal team is keeping on top of the potential new requirements. Because we use FERPA as a baseline for our privacy and security, our above-and-beyond measures are actually already more than will be required with the new revision. What do you mean by SOC 1/ISAE 3402? SOC 1/ISAE 3402 is a rigorous auditing standard that measures the control of information and has replaced SAS70 reports according to the Statement on Standards for Attestation Engagements. In order to host or process customer data, SchoolStatus had to demonstrate that we have adequate controls and safeguards for student data. How do you integrate with 3rd-party vendors? Our proprietary software integrates through a variety of different methods, but the cleanest is via API key. The most important part of the secret sauce? No one from your district has to manually import or export the data, it’s done nightly and automatically. If our district changes student information systems (SIS), what happens to our data? With SchoolStatus, you never have to worry about losing data when changing vendors. All of the data pulled from your SIS will remain in your SchoolStatus account. Do you ever share the data you have access to? No way. SchoolStatus specializes in helping you make the most of your data – but the data itself is yours, we simply aggregate what you’re already tracking and drill it down to the points most important to your staff. We take student data privacy very seriously, and as most of us are parents ourselves, we stand by the guiding principle that children’s information should always be protected. Who in the district has access to the data? Visibility allowances correspond to the position and rank of the individual: teachers see data from their own students for as long as the student is in the class, principals see the whole school, and district admins see the whole district. Custom allowances or specific groups can be made by district admins as they see fit. Can teachers see all of the district data? Teachers only have visibility for the students in their classes. If they need visibility of a student card outside of their class (RTI specialists, coaches, etc), a district admin can create a group to make that possible. For more information on how to create custom Student Groups, check out our support page for tutorials. How much does your PD cost? Our training is actually included in your annual subscription price and is unlimited. We want your team equipped, happy, and using SchoolStatus on a daily basis, and we believe being well-trained is key for that kind of implementation. For your convenience, you can even schedule your training online. What additional equipment costs or personnel requirements will we incur? Because we are cloud-based, there is no additional equipment to purchase or strain on your existing data center. And because the integrations are updated automatically each night, no additional personnel are required to maintain or manage your subscription. Is there a limit to the number of integrations I can have? No. Whether you integrate with four or 40 third-party platforms, we can pull data from all of them. How does your pricing work for multiple years? Our standard agreements are for three years as we want to ensure satisfaction with longitudinal data as well as initial implementation and ongoing training. We do honor custom contracts on a district by district basis and all agreements are billed annually. We've used a 'data warehouse' before... how are you any different? The term ‘warehouse’ is indicative of many of the early software systems on the market, because they do a great job collecting the data – but then it just sits on a shelf. Our next-generation approach comes from the understanding that most districts are currently collecting and tracking data in some form or fashion, but what we do best is present your data back to you through beautiful visualizations and provide powerful and intuitive dashboards and interfaces with powerful and intuitive reporting features so you can get that data off of the dusty shelf and actually put it to work helping your students! How do you compare to an LMS or SIS? We integrate with both of those tools, maintaining consistency for those users comfortable with specific features in your current LMS or SIS. What we provide, is a common district-wide platform to view ALL of the data you are currently monitoring, and powerful tools to help you track it, analyze it, and put it into action. Does SchoolStatus do lesson planning? Lesson planning is so closely tied to content and curriculum, that it didn’t make sense for us to compete with the many top-notch products already available to educators. Instead, through our third-party integrations, we include the results along with all the other data in your SchoolStatus overview called the Student Card. Is SchoolStatus on Social Media? What if I want new data added to our account? I'm trying to build a custom report, but I'm stuck. Can someone help me build it? We’d be happy to! Email: help@schoolstatus.com, let us know what you are looking for, and one of our reporting experts will get back with you as soon as possible! If you’d prefer to walk through it with us, our customer support team is available at 1.855.9.STATUS via phone 24/7 to guide the way. Click the ‘Forgot Password?’ link and you will be asked to enter your username. Remember your username is the email address associated with your account (most likely your school email address). You will then receive an email with a link to reset your password. If you still can’t log in, give us a call at 1.855.9.STATUS or 1.601.620.0613 and we’ll get you going! I have a really great idea I'd like to share with you guys. Can I suggest a feature? Yes, please! We love hearing your ideas! Our software was developed based on teacher experience, and most of our new feature releases have come directly from customer requests. It’s one of the ways we strive to stay connected to your needs as educators. Do you have any on-demand tutorials? Yes! Quite a few, actually. Visit our Help Library to find a variety of video tutorials as well as PDFs. I hate emailing customer service, can I just call and talk to a human? Of course! We have support staff available 24/7. Call us at 1.855.9.STATUS or locally at 1.601.620.0613. We also have a live chat option during business hours from 8 am to 5 pm, Monday through Friday. Don’t hesitate to reach out if we can be of more assistance. 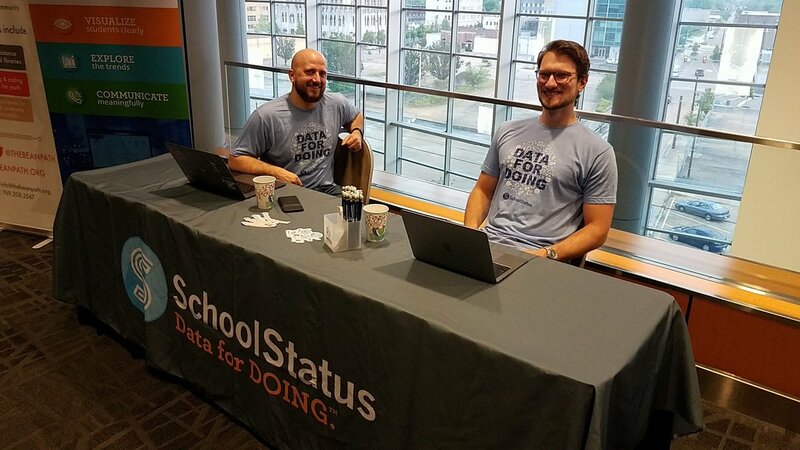 Shout out to @SchoolStatusApp for being a sponsor of @MagnoliaJSconf . This couldn't happen without your support.